What does it take to discover a new species? Do butterflies really drink turtle tears? And why do birds and monkeys like to chow down on clay? These are just some of the questions that drive scientists to spend weeks, months, and sometimes years living in the jungle. 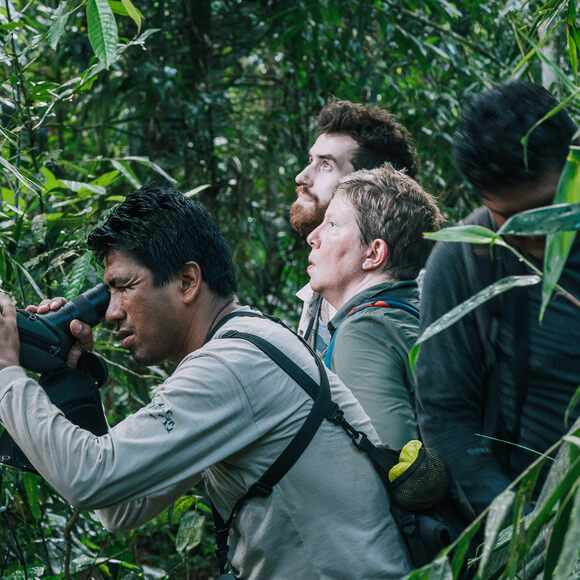 Get a unique opportunity to experience this lifestyle by spending a full week with scientists in some of the most remote rainforest eco-lodges in the world, deep in the Peruvian Amazon. This isn’t your typical Amazon tour. With the help of local tour guides and expert wildlife biologists, you’ll enjoy a rainforest experience unlike any other. 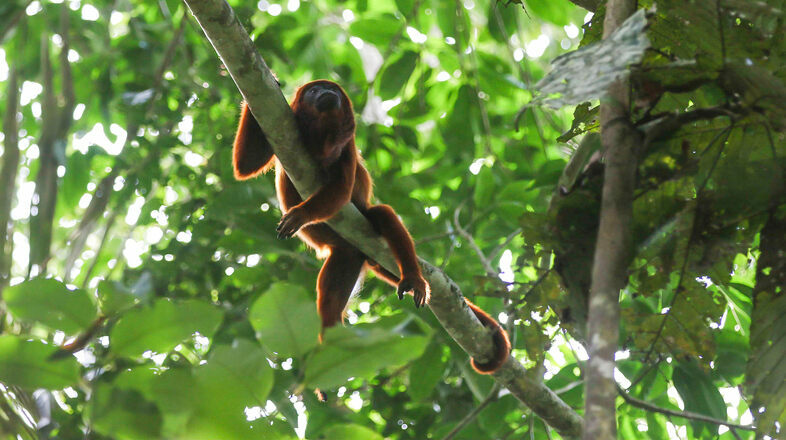 Learn how real-life field biology works, have a chance to discover and observe new species, and get a living lesson on the ecology and conservation of one of the planet’s most important habitats: the Amazon rainforest. Arrive in Lima, the capital and largest city in Peru, by 7 p.m. Travelers who arrive in Lima earlier in the day will have the option to join a guided, behind-the-scenes visit to Lima’s Natural History Museum either in the late morning or early afternoon. 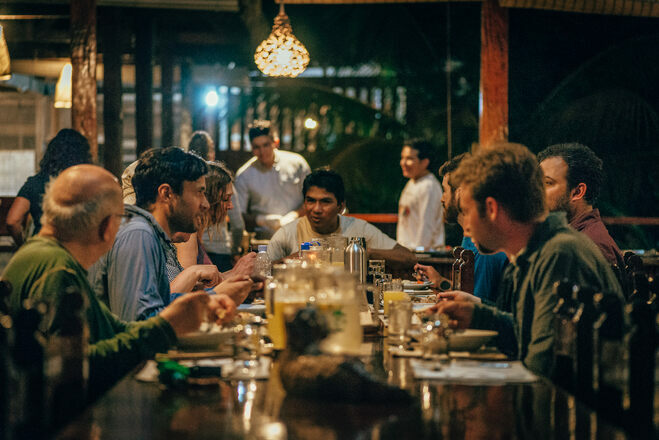 This evening, start getting to know your expedition companions over a group welcome dinner at a restaurant near the hotel. 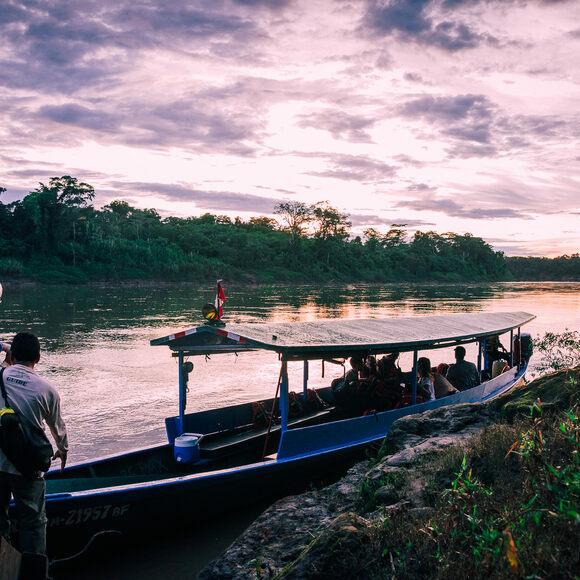 Afterwards, our guides will provide a brief orientation and overview of the upcoming week of adventure before everyone turns in for a good night’s rest before our morning flight to Puerto Maldonado, our Tambopata River point of embarkation. After an early, light breakfast at the hotel, we'll head to the airport for a three-hour domestic flight from Lima to Puerto Maldonado, with a pit stop in Cuzco. Upon landing, we’ll meet our local guide and take a quick van ride to Rainforest Expeditions HQ, where you can re-pack and change into more comfortable jungle attire. After another van ride to the port in the community of Infierno, we’ll board a motorized canoe and head upriver to our first lodge, Posada Amazonas, located in Infierno’s Primary Forest Private Reserve. We’ll spot turtles (watch for butterflies drinking their tears! 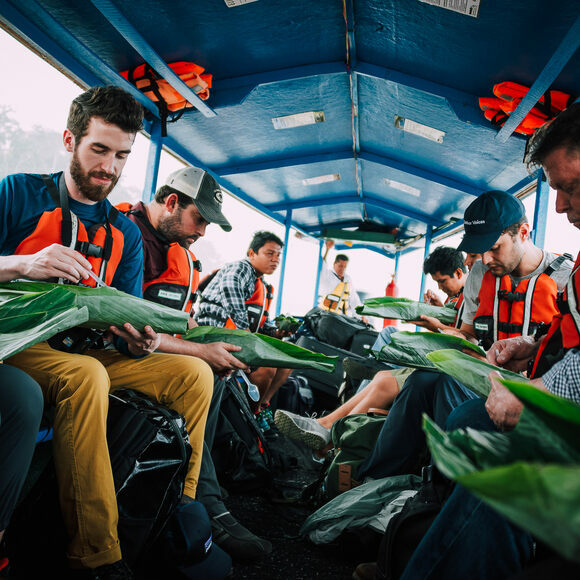 ), caimans, and more—and enjoy a traditional, tasty, leaf-wrapped lunch onboard. After checking into our rooms at the lodge, we’ll head out for a canopy tower climb just in time for sunset, watching for canopy-dwellers such as toucans and the seven types of monkeys that live in this area. Back at the lodge, we’ll discuss our days’ worth of observations over dinner, followed by a presentation on community-supported ecotourism by the Ese-eja indigenous guides. Posada Amazonas is co-managed by Rainforest Expeditions in partnership with the local Ese-eja community of Infierno. Once the sun goes down, the entire rainforest changes. After dinner, if you still have energy, join us for an optional evening jungle walk; we’ll be looking for spiders, frogs, snakes, and other nocturnal critters. Following breakfast at sunrise and a 30-minute boat ride, we’ll arrive at Tres Chimbadas Oxbow Lake. From a catamaran, we’ll try to find the resident family of giant river otters as well as other lake-dwelling critters, including black caiman, anaconda, and hoatzins. Also known as stinkbirds, hoatzins are the only birds that eat leaves, which basically makes them flying cows. Lunch will be back at the lodge. In the afternoon, we’ll travel by river to Centro Ñape, a communal organization that produces traditional medicines from the forest and administers them at a small clinic. A trail walk will allow travelers to learn about (and possibly try) the different medicinal uses of jungle plants, used in the indigenous communities in treatments for everything from insomnia to cancer. 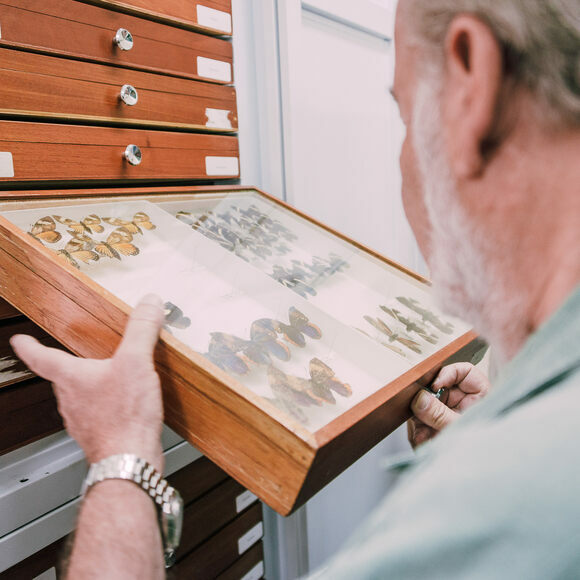 After some time back at the lodge to rest, we’ll be treated to dinner and a presentation by Phil on his research in the region—and how, exactly, one discovers a new species. 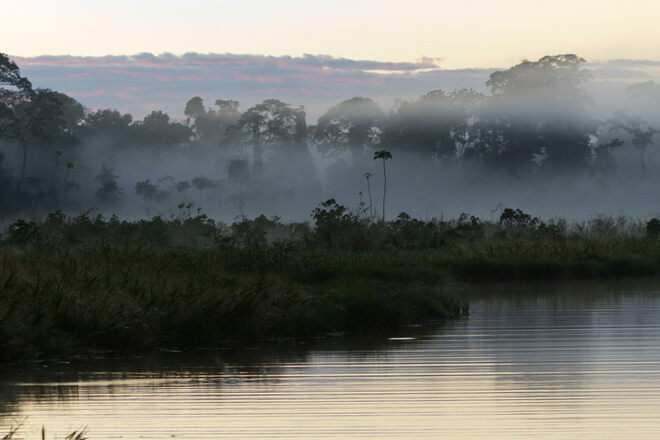 After another early wake-up for a sunrise breakfast, we’ll ride six hours upriver and leave the final traces of human habitation behind, arriving at the world-renowned Tambopata Research Center (TRC). One of the most remote eco-lodges in the world, it sits at the nucleus of a 700,000-hectare reserve, where sightings of capybara, caiman, guans, macaws, and other large species will become more frequent. We’ll enjoy a tasty lunch on the water and we’ll be keeping our eyes peeled for a tapir or jaguar sighting! 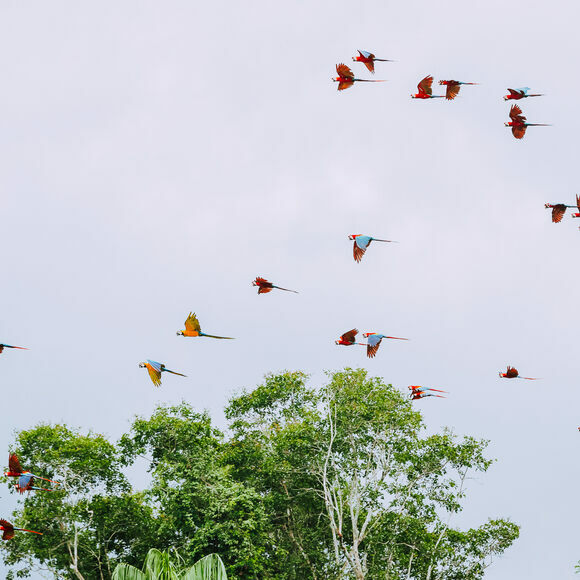 In the afternoon, if the weather is cooperative, we’ll stop on the way at Chuncho Clay Lick, the world’s biggest, most spectacular macaw clay-lick where you can see dozens of brilliant, squawking, fantastically colored birds. Scientists have long debated why these birds like to chow down on clay, but research conducted here suggests that it provides a critical source of sodium, which is otherwise lacking from their diets. After checking into our rooms, we’ll take an afternoon jungle walk on the Overlook Trail, our ears alert for howler monkeys—the loudest animals in the Western hemisphere. 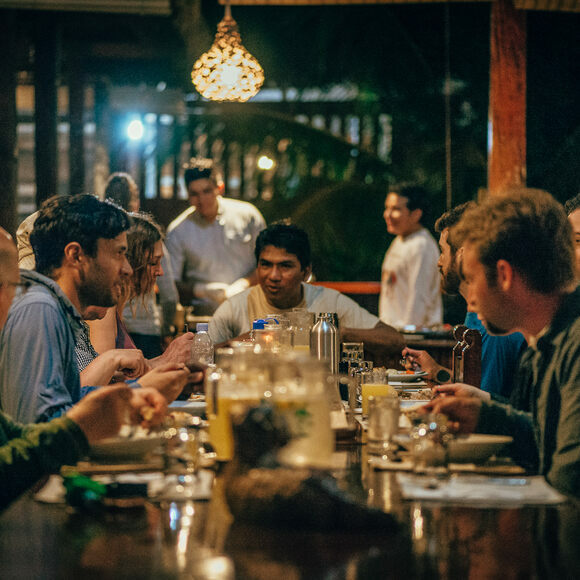 Returning to the lodge, we’ll enjoy a relaxed dinner before hearing from the center’s resident parrot researchers about the most important long-term study of wild macaws in the world, which we’ll get to see first-hand the following day. And if you still have energy, you can join us once again for an optional night hike. We’ll search for frogs, snakes, insects, and spiders. We’ll be keeping our eyes peeled in particular for one of Phil’s discoveries, the decoy spider, found only here. At sunrise, we’ll take a short boat ride to the Colorado Claylick to observe macaws. Hundreds of parrots congregate on this riverbank each morning (as long as it isn’t raining) to eat the clay, a raucous and colorful spectacle. Back at the research center, we’ll enjoy a hearty breakfast before setting out for a morning of assisting parrot researchers, where we’ll watch as the researchers climb as much as 30 meters above the forest floor to monitor both natural and artificial nests. Back on the ground, we’ll assist as they weigh and measure the chicks to monitor their growth. You’ll be stunned: despite the majestic beauty of adult macaws, the babies are really quite adorably ugly. Following lunch at the lodge, we’ll check out a tiny pond upriver where we’ll look for waterfowl like the Muscovy duck, sunbittern, and hoatzin, along with woodpeckers, oropendolas, flycatchers, and parakeets. This evening, after another delicious dinner, we’ll be treated to a presentation by Jason on life as a wildlife reporter and how he manages to stay optimistic despite the immense conservation challenges the world currently faces. For those needing some perspective on our planet, we can then head to the river to see the Milky Way glowing in the sky. Following breakfast, we’ll take the boat approximately 3.5 hours to our last lodge, Refugio Amazonas. After checking into our rooms, we’ll head five minutes downriver to a community farm in the nearby community of Condenado. As your guide translates, you’ll learn all about a typical farm from the local community and will also have the opportunity to see, smell, touch, and taste Amazonian fruits you’ve likely never heard of such as the Copuazu, ‘Fish-eye’ Chili, and Cocona. Following lunch back at the lodge, we’ll take a walk to a harpy eagle nest! This is the largest bird of prey in the Americas. We’ll also visit the canopy tower to enjoy one last view above the jungle canopy, and observe the Aerobotany researchers programming their drones as they work to understand the incredible diversity of Amazonian plant life from the air. Before dinner, we’ll hear a lecture from the researchers about their work studying the region’s elusive mammals by using an array of hundreds of camera traps. After our final dinner together in the rainforest, we’ll set out on one last exploration to see predatory glow-worms, tailless whip scorpions, and other unique creatures of the night. After an early breakfast, we’ll transfer by river back to Puerto Maldonado and then by van to Rainforest Expeditions HQ where we can change and re-pack before returning to the airport. Depending on timing, we’ll take a quick spin around this Amazonian mining town, and taste a palm beetle grub at the local market if you’re feeling adventurous (or just hungry). From here, it’s time to fly back to Lima’s Jorge Chávez International Airport and connect to your flights home. Amazing opportunity to experience the rainforest with people who are knowledgeable about and who get truly excited by plants, animals, birds, insects and spiders; and who care deeply about conserving the environment and fragile ecosystems; and want to support sustainable practices around ecotourism. We recommend you have a medium fitness level to fully participate in this trip. Be prepared to walk up to five miles per day through thick, muddy jungle terrain. Keep in mind this will be much more taxing than five miles of flat pavement. Throughout our time on the river, explorers will be getting in and out of our boat, and you will also have the opportunity to climb multiple canopy towers, which involve several flights of stairs. While Rainforest Expeditions excels at catering to travelers, and the lodges are quite nice and the food is delicious, please keep in mind we are venturing deep into the Amazon jungle to facilities only accessible by boat. We’ll be walking several miles per day through warm and humid jungle habitats on trails that in some places are covered in ankle-deep mud. Visiting this part of the world requires moderate physical effort, but the reward when you see your first wild macaws or catch a glimpse of an elusive tapir is well worth it. That being said, our days should not feel exhausting; you’ll be hiking just hard enough to get a very good night’s sleep every night. Please keep in mind that we are venturing deep into the Amazon jungle to facilities only accessible by boat. If you have any medications, don’t forget to bring enough with you, sealed in plastic Ziploc bags. The rooms at all three lodges are open to the rainforest on one side so you can fall asleep watching the fireflies and wake up to the throaty calls of howler monkeys. The beds all come equipped with heavy mosquito nets. Don’t forget to put the nets down before you head to dinner each night. In terms of disease risk, malaria and zika are incredibly rare, but they are present; travelers should consult their own doctors about potential preventative measures. Leishmaniasis is present as well (and is treatable). All of this is why DEET and long sleeves are required, especially at night. Finally, a yellow fever vaccine is not required, but travelers may wish to consult their own doctors. Other CDC recommendations for travel in Peru may be found by clicking here. For flights in and out of Lima's Jorge Chávez International Airport (LIM), please note that you should plan to arrive any time before 7 p.m. on March 3, and should depart on March 9 after 7 p.m., or after 8 p.m. to be safe (On our return flight from Puerto Maldonado, we anticipate landing in Lima around 4:30 p.m.) Please note that if you would like to join the Natural History Museum tour on March 3, you should plan to arrive on March 2. Should you like to spend any extra days in Lima before or after our week together, we're happy to arrange extra hotel nights for you, and will provide the option in your final payment. All meals and accommodation during your stay. Internal flights between Lima and Puerto Maldonado, your Tambopata River point of embarkation. Tips for the local Amazon guides. 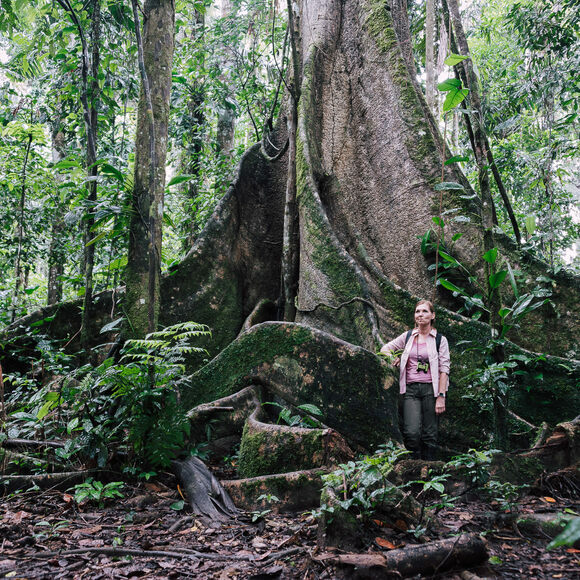 Company of two expert guides in the field of biology, conservation, and science journalism as well as local guides on each of your rainforest excursions. Transportation and flights to and from Lima. Transportation from the Lima airport to the group hotel. Does this trip require vaccinations? Peru does not require any immunizations for entry, although it recommends vaccination against Yellow Fever. Travelers may wish to consult their own doctors. Other CDC recommendations for travel in Peru may be found by clicking here. Will I be sharing a room in the rainforest lodges? Space at these remote lodges is limited, which means you will most likely be sharing a room with one or two fellow travelers, though we do offer a very limited number of single rooms available on a first-come, first-served basis. The International Ecotourism Society has formally defined ecotourism as “responsible travel to natural areas that conserves the environment, sustains the well-being of the local people, and involves interpretation and education.” In other words, it is an effort to combine sustainable travel with ecosystem-level conservation and the explicit recognition of and respect for the rights of indigenous people. That’s why ecotourism is more than just “nature tourism”; it has the explicit goal of benefiting local communities both environmentally and economically. By providing financial incentives through tourism, these communities can become empowered to fight against poverty, and in achieving a more sustainable sort of economic development, can better resist other more exploitative industries like mining, agriculture, ranching, or logging. Ecotourism has also motivated the traditional tourism industry in general to move towards more “green” or sustainable practices. Do I need a travel visa for Peru? All you need to enter and depart Peru is a valid passport with evidence of return or onward travel. With a U.S. passport, you will automatically receive a free 90-day tourist visa. For more information, see the State Department’s Peru travel page. Do you have an extension to Machu Picchu? While we don't run our own Machu Picchu trip, we're more than happy to provide recommendations. For a small supplement, we can customize your regional flights, allowing you to deplane in Cuzco, with a later return to Lima. Delve into this equatorial paradise for a week-long journey full of adventure, photography, and learning in some of the wildest corners of the Amazon basin.